picked it for kame. what can i say. i have no excuse. the love is still strong; after nobuta no produce i forgive him and yamapi any sin. actually, that's not really fair to kame -- i think he's one of the better actors of the JE boyband troup; at least as far as i have seen so far (ninomiya is my current fave). unfortunately kame, or whoever picks roles for him, has no taste, so one must be prepared for some pain. but hey, "life is pain", sez westley. suppli is based on the josei manga by okazaki mari (not scanlated, licensed by tokyopop), which i haven't read. it's mostly a workplace love story, taking place in an ad agency. the title does not stand for the italian snack, but is short for "vitamin supplements" -- don't ask me. i've given up trying to discern rhyme or reason behind japanese titling. minami fujii (ito misaki) is a dedicated and successful copy writer in her late twenties who's basically married to her job -- in the first episode we see that her boyfriend has had enough of that, and breaks up with her. outwardly she is is cool and put-together, but inside she's a hopeless romantic, asking herself whether there isn't something more. 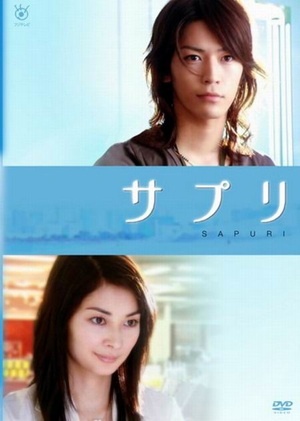 enter ishida yuuya (kamenashi kazuya), a young, dissheveled slacker, who gets hired as a part-time gopher by the agency. he and fujii have a "fated" encounter the morning of ishida's first day at work wherein she finds his cell phone (hot pink! with the cutest little amigurumi vampire dangling from it -- i swear kame is an otomen), and they end up both standing at an intersection watching an ad in which a puppy runs through the rain, which has them all introspective. but they don't actually meet until later. ishida pretty much falls for fujii right away, and is spurred on by his admiration for her to get more involved in actual work than he's been before, where he discovers his creative side. but fujii has only eyes for ogiwara satoshi (eita), who is the opposite of ishida -- professional, successful, and suave (unfortunately also somewhat unscrupulous). ogiwara flirts with fujii, but he is still hung up on his on again / off again mistress tanaka mizuho (ryo), who is married. yup, she also works in the ad agency, that hotbed of amorous undercurrents. there's no overacting here (yay), the setting is interesting, and the process of developing ads, deadline pressures, and cut throat competition feel realistic to me. the production values are good. this could have been fun, but as it is i think i'd only recommend this to kame completists. or, you know, if you're really bored, or want to practice your japanese listening skills. that's something japanese TV dramas are definitely good for, because of their short runs (usually just one season of 9-12 episodes), and the fact that the modern ones use relatively simple, common japanese. ps: koike teppei sounds even happy when he sings; it just shines through his voice. awww. Current Music: wentz&teppei - ready go!